Mississippi Gulf Coast casinos provide an atmosphere of carefree fun and relaxation. What began as notorious Mississippi river boat gambling has blossomed into legalized gaming. Mississippi casino resorts provide the best of Southern culture - fine dining, spas, shopping and family activities. Mississippi Gulf Coast casinos offer shows, concerts, golf, deep sea fishing and beaches. Mississippi casinos provide a waterfront setting for special events such as weddings, reunions and conventions. Mississippi casinos are the cornerstone of gulf coast tourism. Mississippi coast casinos use entertainment and attractions to lure tourists and locals to Biloxi, Gulfport, D’Iberville and Bay St. Louis. When you arrive, casinos provide food, entertainment, blackjack, craps, roulette, slot machines and alcohol to create a carefree atmosphere of fun and escape. There are times when good natured fun and celebrations go too far. Sometimes a night that starts with casino fun ends in legal trouble resulting in police custody. Occasionally a night of entertainment and alcohol ends with being arrested for public drunk or disturbing the peace. Often it is difficult to tell the difference between excited loud enthusiasm or drunk and disorderly conduct. This happens in an atmosphere where Mississippi casinos encourage patrons to indulge their passions in the 24 hour excitement of a casino. Casino security is authorized to make citizens arrests if they believe the patron’s conduct is disruptive or violates Mississippi law. Typically casino security will call the local police department who can file more charges such as resisting arrest. Casino visitors leaving after a late night can be charged with open container violations or even driving under the influence. Letting the good times roll with excessive alcohol use can lead to poor judgement resulting in being charged with solicitation, prostitution, or possession of controlled substance. Although marijuana may be legal in some states, it is illegal to possess or use marijuana in Mississippi. A night of escape and harmless fun can end in a nightmare of arrest and legal problems. Casino row attracts tourists, out of town visitors, and local residents to night clubs, both in and near casinos. While gambling does not occur in the nightclubs, the party atmosphere combined with alcohol can cloud decision making. When carefree turns to careless, it’s easy to end up in the wrong place and be charged with a crime. Visitors, as well as residents, may be charged with an alcohol related crime such as disorderly conduct, disturbing the peace, or resisting arrest. For example, singing along with the band does not authorize a patron to jump on the stage. Club security is authorized to make a citizens arrest on sight and call the police. Couples wanting a romantic, carefree weekend can escape to Mississippi Gulf Coast casino resorts. A day of golf or deep sea fishing is followed by a night of restaurants, theaters, bars, clubs, blackjack and slots. Sometimes the atmosphere of flowing alcohol can lead to charges of domestic violence, assault, malicious mischief, vandalism, or destruction of property in hotel rooms. Unfortunately, a carefree weekend can become a horrific nightmare if arrested for sexual assault in a casino hotel. This is a serious accusation and charge. Your personal or professional reputation can be forever marred. The Mississippi Gaming Control Act authorizes Mississippi coast casinos to offer patrons a line of credit called a marker so the patron does not have to carry large amounts of cash or use an ATM. A marker is like a counter check and clears through the patron’s bank account. Markers make it easy to keep betting on table games such as blackjack, craps, roulette, or baccarat. Fortunes can change hands rapidly. If the patron does not repay the marker within the specified time, the District Attorney is authorized to prosecute unpaid markers under authority of Mississippi’s bad check laws. Casinos do not necessarily advertise the fact that you are drawing a line of credit by use of their markers, but a patron is required to complete a credit application in order to obtain a marker. Even casino employees are not exempt from being charged with a crime by their casino employers. Mississippi Gulf Coast casinos employ thousands of employees to fill a large number of different positions to keep the 24 hour casino operations running smoothly. Some employees may be service workers while others possess a gaming license. When there is a problem, the casino will often investigate an employee’s participation in a crime. Casino employees can be charged with violation of gaming laws, cheating, embezzlement, false pretense and larceny. 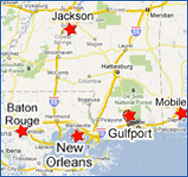 If you or someone you love has been arrested in a Mississippi Gulf Coast casino or nightclub, we can help. Please do not gamble with your future. Call the Law Office of Rufus Alldredge at 228.863.0123 today. We are located at 1921 22nd Ave., Gulfport Mississippi 39501 in the heart of the geographic and business center of the Mississippi coast. We defend all accusations of compromised behavior in a casino resulting in criminal charges.